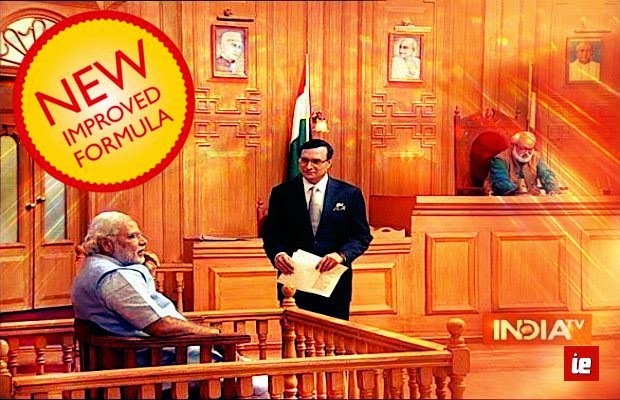 I think few things should be clear about the recent episode of Aap Ki Adalat on IndiaTV which featured Narendra Modi – Mr Modi was well prepped before this “court-hearing” style interview. Now I do not wish to project it as anything negative right away. To understand Indian politics in fair term you’ll have to pin the idealism for a while. Strategically speaking, an interview during elections is a part of the whole BJP-Modi campaign. The aim of this interview was to project Narendra Modi as a human-likeable character – and possibly change his “ruthless-monster” image which has been projected by his detractors and the media (supposedly hand-in-glove with those detractors). Did the drama work? In my assessment, it did – and this interview will get Mr Modi many more supporters in the days to come – and will reflect in the elections. Now, I do not mean to say that this is my opinion of these leaders. This is what would be encapsulation of the negativity associated with these political characters. Any smart campaign manager would like to help their candidate rise above these negative perceptions in public eye. And will chose the time right before / or during the elections so the image-makeover sticks. Both Rahul Gandhi and Arvind Kejriwal have failed to achieve this. Rahul Gandhi needs to look more decisive, his most recent speeches are an improvement from the past, but too little too late. And Arvind Kejriwal’s luck has been going downhill from the time he chose to resign from Delhi. Delhi was an opportunity for him to show the world that he can do more than talking. Now he’s going through severe credibility crisis in the voter’s minds. Modi campaign has just managed to achieve the “shedding of old-skin”. I do not even want to even discuss the fact that Rajat Sharma interviewing Narendra Modi was NOT a fixed interview. That it was not an extension of “Is baar Modi Sarkar” advertisement. If you believe that Mr Modi didn’t know the questions before hand – you’re way too naive to be reading this. Go back to living in your lala land. It’d be foolish of Narendra Modi to even attempt a genuine interview at this juncture – when a mistake can’t be recovered from and can cost you an election. Rahul Gandhi has made many such mistakes. In fact, there was a joke circulating on the internet a while back that every time Mr Rahul Gandhi opens his mouth, Congress loses 5 lac votes. It could very well be true if someone cares to do an analysis – but that will be a big waste of time. Anyway, Rahul Gandhi made a big mistake by getting interviewed by somebody like Arnab Goswami – ballzy move, but as usual stupid. Somebody as idealist as Arvind Kejriwal (or atleast wishes to carry the torch of idealism) never dared to face Arnab. I don’t think that’s because he fears tough questions. The thing is Arnab doesn’t let you walk-away. And no politician exists which hasn’t indulged in double-speak, or who doesn’t have a few skeletons of his own in his closet. Whereas journalists like Raveesh, Poonya, Rajdeep and Barkha have been very accommodating towards Arvind. In fact, if ex-AAP leader Ashwini Upadhyay’s words are to be believed, Raveesh, Poonyaprasun and Rajdeep were in the process of starting their political careers on AAP tickets. They backtracked seeing Ashutosh’s condition. They decided to stick to their lucrative careers for now. Coming back to the interview, some highlights are discussion worthy. Did you notice the audience? I’d like to know from Mr Rajat Sharma – who picked this audience? Even the shows like Comedy Nights with Kapil in today’s date have audience picked via a casting company. Audience is paid wages to clap and dance. So, I won’t be surprised if the same was the case with this over-zealous audience. Yes, there’s a Modi wave in the country – but he’s still not getting the 100% of the votes right? Not even the 80% … so a balanced group of people would have people who’re fans of Narendra Modi, who support Modi conditionally, then there’ll be those who’re fence sitters – and then some who out rightly oppose him. Did the group seem like that at all? They looked like they were watching a cricket match – and that one too where every ball is being sent to the boundary? Campaign team of Modi ji, it would have looked more original had the audience been a little tame – still cheering, but within reason. Think about it next time. The first line of the interview which really stood out was when Rajat Sharma was counting the name of the leaders which keep calling names to Mr Modi. Rajat Sharma went as far as implying that they’re obsessed with Narendra Modi. The leaders he named were Sonia, Rahul, Chidambaram, Sharad Pawar … what surprised me was that Rajat Sharma gave AAP and Arvind Kejriwal a complete amiss. Why? 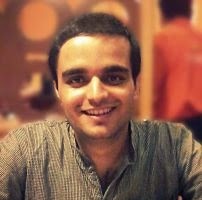 As far I know, I don’t think there’s anybody who is more obsessed with Modi than Arvind Kejriwal and Aam Aadmi Party – for good reasons or bad that is immaterial. AAP is so obsessed with Modi that they have even forgotten their core agendas – corruption & transparency. Arvind Kejriwal has even forgotten that there are more leaders and 27 other states in the country. World seem to have closed down over Gujarat and Mr Modi for him. So it surprises me that why would Rajat Sharma completely ignore Arvind here? He did mention Kumar Vishwas and his constant appreciation for RSS and Narendra Modi. What is BJP upto? Probably, they have found faultlines in Aam Aadmi Party and plan to tap them soon. Probably, in Kumar Vishwas BJP see somebody who can be a potential friend in future. Probably, Mr Modi thinks that Kumar Vishwas can be used against Arvind Kejriwal. There’ve been reports which indicate how Kumar Vishwas and other “old” leaders are feeling sidelined in AAP. I can understand Kumar Vishwas’s frustration – now that BJP has sent Smriti Irani to Amethi, the anti-congress vote will be further divided. Did BJP send Smriti to Amethi to diminish increasing influence of AAP there? Where Arvind Kejriwal can’t digest his food without calling names to Narendra Modi – Modi himself has refrained from returning the favour so far. May be once a while he has used some off-handed remark like AK49 to ridicule AAP’s 49 days of adventure in Delhi. But nothing beyond that. This when Arvind Kejriwal is direct challenger in Varanasi. Why would Mr Modi deprive Arvind Kejriwal the attention that he deserves in this case, at least? The “future Prime Minister” will have to be foolish to consider Arvind Kejriwal a non-threat, and I’m sure that is not the case here. Modi possibly doesn’t want to award Kejriwal the stature that he yearns so desperately right now. He doesn’t wish to treat his as an equal. He’d rather target “shehzaade” who can’t frame a proper sentence to defend his party. Modi would rather waste his time on Sonia Gandhi – who has acquired the image of evil personified among Indians. But Modi does have his one eye on Arvind Kejriwal. You know why? Because he knows that his troubles won’t end even after winning the elections. Where before 2012 all he had to do was to decimate already beaten Congress – Aam Aadmi Party has emerged as a new challenger, which will keep him on his toes even in the office. Somebody at Modi’s level doesn’t want to settle for just one term – I’m sure he’s already thinking and planning for next term. I’m sure he’s already planned to appease the old-guard by restoring their “due” respect. Advani will be the President one day. Rise of Narendra Modi will change many things – there’s already reports of RSS revamping it’s shakhas. Channels like NDTV and CNN-IBN will have to re-think their strategies. I mean these people are news-traders, and rise of Modi will initiate a complete overhaul in power-structures and their loyalties. Channels like IndiaTV (even with one of the most sub-standard content) will be amply rewarded. Rajat Sharma, who once used to be an ABVP leader in his college days, good days are to come for you. Modi doesn’t have many friends right now in media. Note 1: Many readers have asked that Arvind has appeared on Times Now, then why this article states that he hasn’t. Please note that the article doesn’t refer to historical interviews. That way, even Modi has appeared in Frankly Speaking. Post-Delhi, AAP and Arvind Kejriwal have boycotted Times Now. AAP cites impartial treatment as the reason for this. I won’t discuss the viability of their charge on Times Now in this post – because it’s beyond it’s scope. This posts, as a matter of fact, considers Rahul Gandhi’s choice of Times Now, as his first interview as strategically foolish and acknowledges why both Modi and Kejriwal may want avoid Arnab Goswami this close to elections.